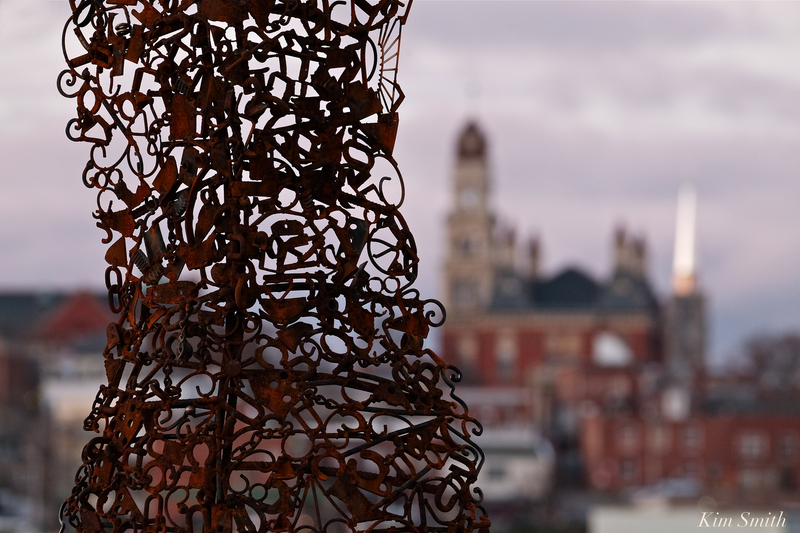 When I look at the subtle artistry of “Dive Deep Within,” I am reminded of the humungous abrasive metal sculpture that our community has been highly pressurized to accept, to not only find a suitable location for its installation, but to pay for its fabrication as well. One suggested site was the tiny narrow strip of green grass on the Rocky Neck causeway. When that location was wholeheartedly rejected, the next attempt was to locate the sculpture at the beautiful, but again very small, Solomon Jacob’s Park. This suggestion was especially nonsensical because the Solomon Jacob Park was specifically designed to be an open window to the working waterfront. 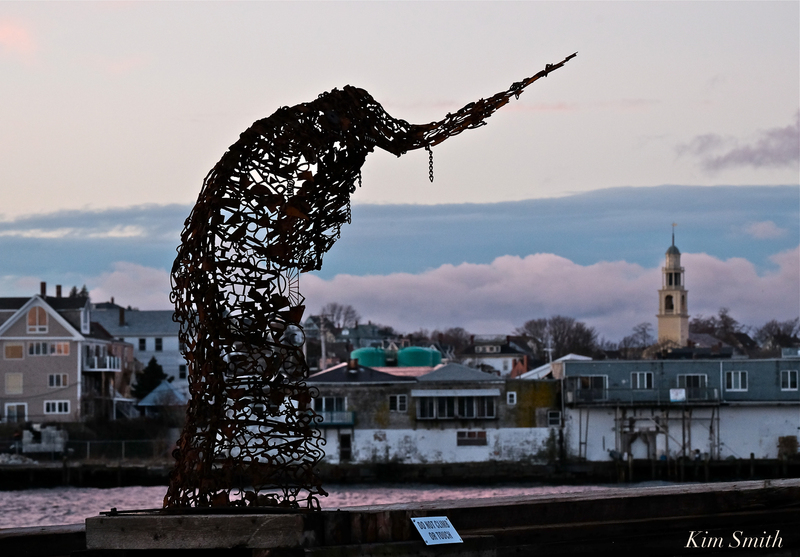 Monumentally large sculptures like that perhaps look best when sited in vast open spaces, a midwestern prairie or on a farm field; at a similar place where from the artist has made his home for most of his life, rather than Gloucester’s stunning waterfront. This entry was posted in Gloucester and tagged Anna Hyatt Hunington, David Black, Deborah Redwood, Dive Deep Within, Gloucester, Gloucester Fishermen’s Wives Memorial, Goetemann Artist Residency, Joan of Arc, Kim Smith, Leonard Craske, Man at The Wheel, Morgan Faulds Pike, Paint Factory, Paint Factory sculpture, sculture, Whale Tail on December 1, 2018 by Kim Smith. Snowy morning scenes from the boulevard and Eastern Point Lighthouse. 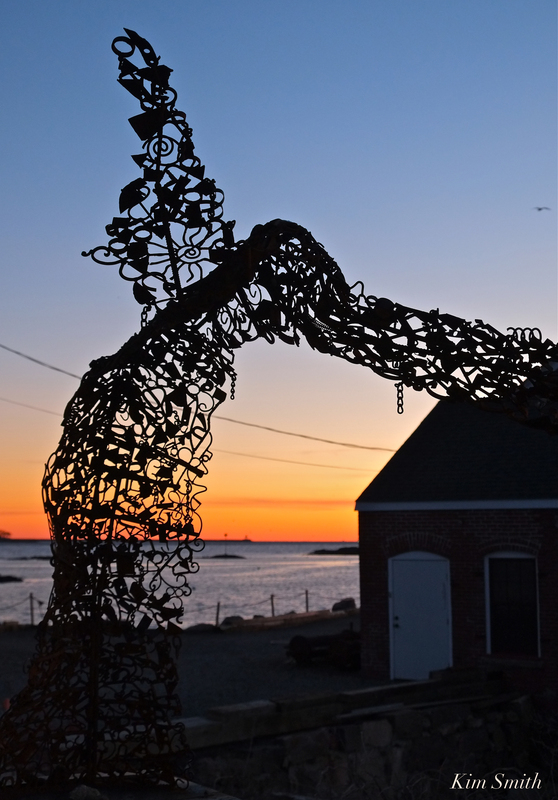 This entry was posted in Gloucester, Gloucester Harbor and tagged Eastern Point, Eastern Point Lighthouse Gloucester, Gloucester, Gloucester Fisherman’s Memorial, Gloucester Fishermen’s Wives Memorial, They that go down to the sea in ships on March 29, 2015 by Kim Smith.